Attention All Melbournians!! 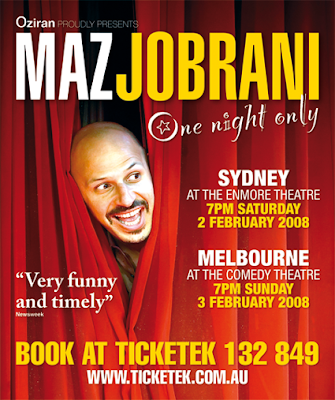 You seriously cannot afford to miss Maz Jobrani. This dude is one of the funniest Americans to perform this side of the equator. Not bad for an Iranian! You can read more about Maz here. His Sydney show on Saturday night 2 February 2008 was an absolute hoot. Yes, there was a large Iranian/Persian element in the audience, but they certainly were not the majority. Maz attracted people from across the ethnic and religious spectrum with his simple message of culturally “mixing it up”. If only John and Janette Howard could have been there. They might have actually learned something! So stop what you’re doing, siddown, shuddup, grab your laptop and purchase a ticket online for tonight, Sunday 3 February 2008 before they all sell out. It’s his only performance in Melbourne and the last gig of his current Australian tour. Don’t miss out! !